Worst blogger ever checking in. The past month has been a complete roller coaster of emotions. Some days are much better than others, but in the end there is still a very active little baby just kicking away inside me. That doesn't stop the occasional breakdown. While I am so happy that butterfly is still baking, over a month of bed rest really wears a person down. I've had to back out of a lot of things we were looking forward to. My friend's bacherlorette party and wedding, any trips up to Boston before baby gets here, no baby shower, no going out for my birthday on Thursday, etc. It all seems pretty selfish in the grand scheme of things, but after struggling with infertility you really look forward to enjoying a semi normal pregnancy and doing normal pregnant lady things. Okay, time to end the pity party. I've had two ultrasounds at the hospital so far in the past month. My cervix has stayed around 2cm long and the stitches are holding very well. At the appointment last week we finally got a picture of butterfly's profile! My mom, who stayed with us last week, was very excited to get to see her granddaughter. 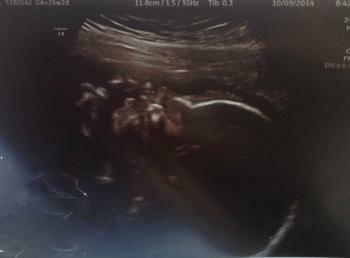 Baby girl had her hands up by her face, you can actually see her little fingers in the picture. The OBs have been happy with the ultrasounds, but my bed rest continues. They do not usually check cervical length after 28 weeks as there is no data to compare it to. Next week is my last cervical length check at the hospital. They will be doing the first growth scan as well. At the 24 week appointment she weighed 1lb 6oz, I'm interested to see how much she's grown. Surprisingly, baby girl is now head down. If she stays that way the cerclage will be removed at 36 weeks and likely be born soon afterwards. Being head down also puts her feet up in my ribs, which she enjoys kicking. I'm constantly amazed at how active and strong she is. Today I told Dave that we'll have to sign her up for karate as soon as she's old enough. 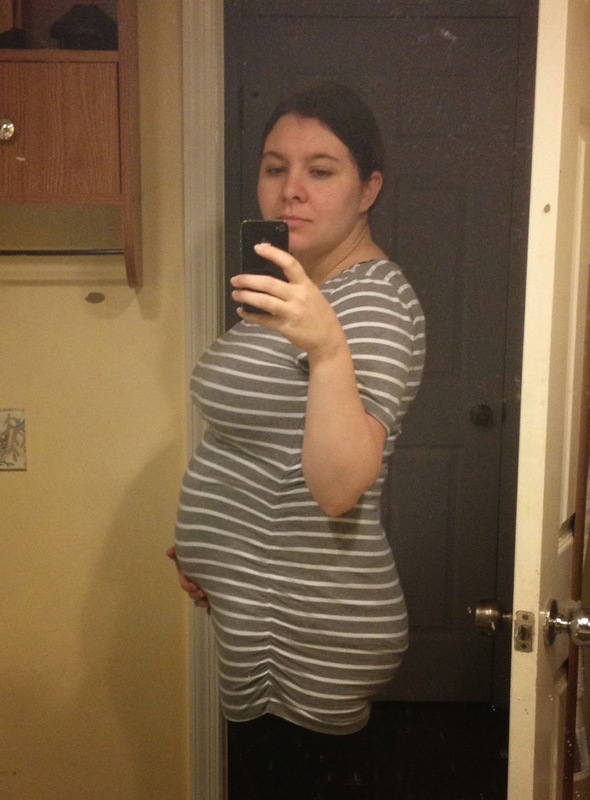 Today I am 27 weeks pregnant, depending on who you ask this could be considered the start of the the third trimester. As baby grows, so does the bump. It's getting harder and harder to find a comfortable sleeping position. My sleep schedule has also been completely thrown off by the bed rest. Thankfully I can still work from home and make my own hours. Trying to take it easy this week as I haven't been feeling well. Hopefully it's just a minor cold and passes quickly, but I'll likely take tomorrow off to rest up. Here is my bump pic from last week. I'm not sure if I'll be going back to the weekly update posts, but will try to post more often.